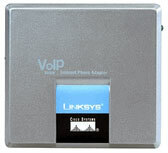 An FXO adapter is a device that lets you connect VoIP systems to regular old landline phones (ie. PSTN lines). They are used where you have some type of VoIP system but where you still need to connect to ordinary phone lines. With a VoIP Virtual PBX to connect to legacy lines. With Interactive Voice Response Software to connect to ordinary lines. With Phone In Dictation Software to connect to ordinary lines. AltoEdge offers both a hardware and software FXO. For more information on our Virtual FXO please see Carousel Virtual Adapter. The SPA-3102 delivers clear, high-quality voice communication in a variety of network conditions. Excellent voice quality in challenging, changeable IP network environments is made possible via Sipura's advanced implementation of standard voice coding algorithms. The SPA-3102 is interoperable with common telephony equipment like facsimile, voicemail, PBX/KTS and interactive voice response systems. Connects VoIP to ordinary external PSTN phone lines. 1 network socket and 1 phone line socket. Can be used as a router if you don't have a network. Configuration is by telephone handset and internet browser. Fully FCC (USA) ETSI (Europe) and ACIF (Australian) approved. Supports G721, G726, G723 and G729 audio codecs. Disconnection by CTC, Polarity Reversal, Silence or Tone.